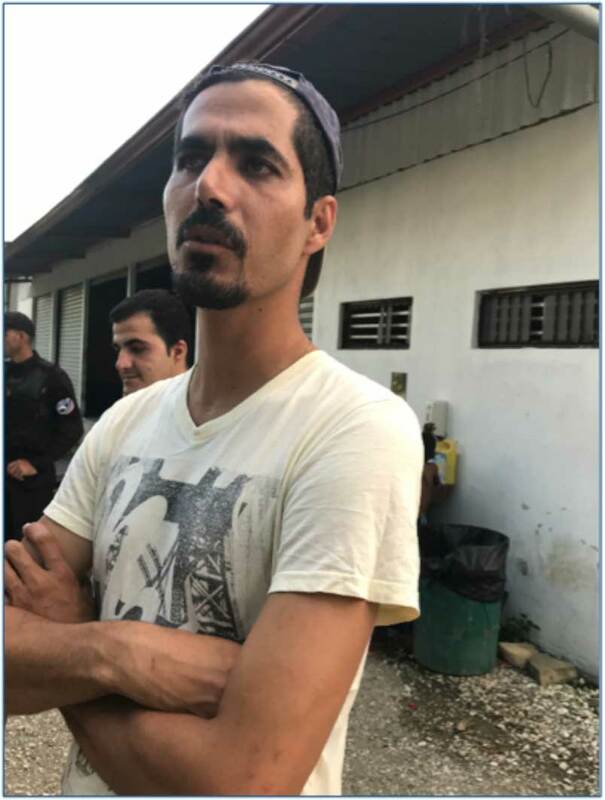 GOLFITO, Costa Rica — Iranian citizen Sina Zandi Chareh Bayan recognized me before I him. A week earlier, he and his three Iranian co-travelers had seen me arrive and walk around a Panamanian government migrant camp at the off-grid Darien State subsistence village of La Peñita, when I and my interpreter pulled up next to it in our rental, parked, and started walking around among various migrants free to mill outside the camp wire. Panamanian police were not interested in allowing us to see, let alone interview, any of these detainees, all of whom were picked up recently in the Darien Gap jungle further south and brought here to rest and catch their breath before being put on buses to Costa Rica. We actually met the next week some 25 miles inside Costa Rica, at another loosely-guarded government camp where migrants processing in openly from Panama are taken, likewise for a couple of days of rest and relaxation. They can leave whenever they are ready, with helpful maps and information to travel north to the Nicaragua border by bus. Of the four Iranians, Only Bayan spoke some English. Q. So tell me, are you Shia? Q. Sunni? In Iran? Are you Kurdish? Q. Tell me, why did you leave? A. As I told you, I think ... I don't think, I'm sure ... I was in danger and if I stayed in Iran maybe go to prison and that's it, maybe I'm not sure, but prison. A. For illicit activity against government, and cruelty and unfairity (sic). But Kurdish people, and Sunni people, of course because the government is Shia and no Kurdish, and Kurdish is a very small province at the west near Iraq. Always, always there is double standard. Another word in English ... is something like race. Racist. Yeah. Q. How did you get here? Did you have to hire a smuggler, or somebody to ... a facilitator? A. No. I took a flight from Iraq to Ecuador because we don't need visa to travel to Ecuador and from there we travel illegally, country by country, until now. Q. You didn't pay someone to help you get into the Darien jungle and everything? A. No. We made it by ourself. Of course another people that has agent, yeah, you know, smuggler called agent. They had agent. They were two days in jungle and we stayed like eight or nine days in jungle because we haven't a guide and we just follow the lead. In the jungle of course are thief, armed thieves who robbed us of everything we had. Phone. Watch. Ring. Everything you see. They took everything, and we made it to here. A. I think we are in some process; we can go to Nicaragua. After that, Honduras, Guatemala, Mexico, and United States of course. And we know the United States is very safe for us. We're not sure but maybe they'll protect us in the United States. We have to go and see what happens. A. Yeah. My friend [indicating Iranian individual standing next to him] changed his religion from Islam to Christian. There was a danger. And I have some anti-government activities, and I had to run. Q. How did you go from Ecuador to Colombia? A. Cross the border illegally. Q. In a bus or how? A. No, at the border we talked to one car and we told him we want to go to Colombia, and he said "No problem, sit in my car and I will cross you the border." And that's what happened. And we paid like $20 for each one. Q. And then from Colombia to Panama? A. From Colombia, we took a bus city by city until Turbo. And from Turbo, we took a boat to Cartagena, and from Cartagena jungle to Panama. Q. And how many days in the jungle? A. Eight or nine. Nine. Eight and half. Q. How did the Panamanian police find you? A. We went to the camp. We surrendered ourselves to police and there was a camp in a small village. Chaqito, name of I don't know, city or just camp. We spend three days there. After they send us to another camp where we saw you. Q. That's where you saw us? Q. Penita. Yeah, we were there. Long way. A. You had a white (car). We were scared. A. I don't know. Because anywhere we feel dangerous. Anywhere we feel not safe. Maybe someone follow us, maybe someone catch us. That's what happened in all of the journey. Q. So did they put you on a bus from La Peñita? How did you get here? Just tell me everything because La Peñita is way out in the jungle. A. Yes. We paid like $20 each one, a hundred people, from Penita to Panama City, and in Panama City we changed bus, 100 percent from one bus to another bus. Q. Were the Panamanian police with you the whole time? Q. From here, though, now what? What is your plan? Q. Who gave you a map? Q. They gave you a map? A. Yes, they gave us a map, and cost the bus $10 or $15, we should pay to the bus to the border of Nicaragua and Costa Rica. Then there's another camp, and we should I think cross the border to Nicaragua. The rest of the story we don't know yet. Q. Do you have money? A. Now? No. Now we run out of money, and we should find somebody because we don't have any ID card. We have someone to give us money there from Western Union. A. We have a friend in Ecuador, because in Iran there is no Western Union, maybe you know. Q. So you have a friend in Ecuador? A. Yes, he send us the money and our family in Iran give money to his family. It's very difficult but we have to. Q. What is the plan for when you reach the United States border? What do you do? A. I think there is a camp in Mexico and we have to wait until they let us through. We don't know yet. Actually, we don't have a plan. We don't know anyone to tell us what we should do. We have to go and see what happens. Q. So you don't know what to do when you go to the border? A. Maybe ... I don't know, there is a little part from another person that heard ahead of us said we should stay in the camp and say our names to police of the United States, and there is a number they gave us. And the number ... to call person and let them through or not. Q. Did the Panamanians take your fingerprints? A. Yes. Panama and here. A. Just that. Eyes print and fingerprints and photos. Q. Have you seen any Americans? Nobody's talked to you? A. Actually, there's nothing about us to be worried and to hide. We will tell the truth. If they accept, good. And if they don't accept, I don't know what and I don't care. As President Trump says many times, the problem is between governments, not people.